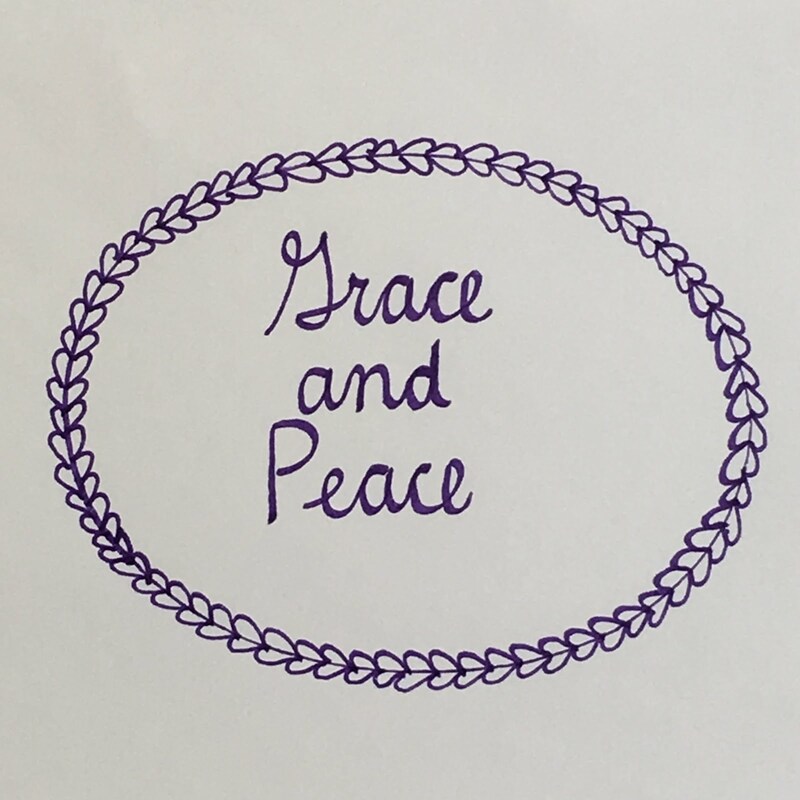 Grace and Peace Quilting: Mini Quilt Finishes! 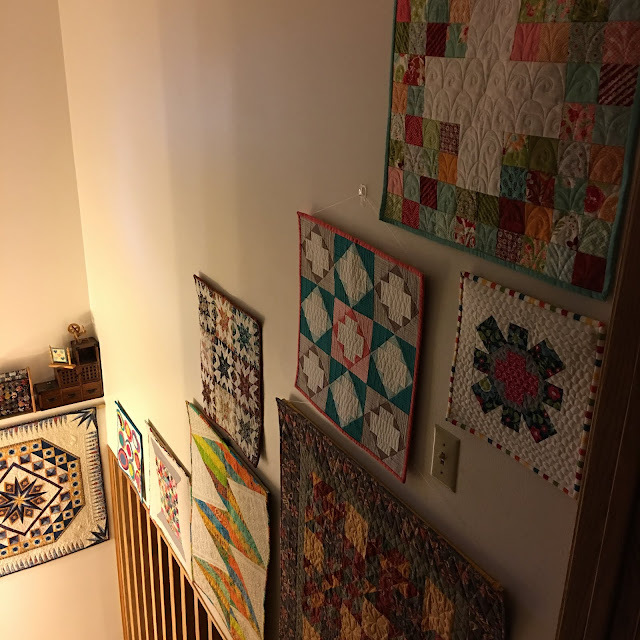 I've been working on a few miniature quilts for my stairway quilt gallery recently. I have 3 finishes to share. This first is a giant spool of thread, made from 120 different fabrics! The squares finish at 1". The pattern is Vintage Cotton Reel Mini Quilt by Tied With a Ribbon. I quilted it with matchstick quilting. The backing is a bit of extra-wide backing I have left over from a previous project. It lists the names of colors from the Crayola Crayon box. I bought the original piece from Massdrop. 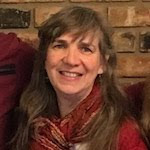 Check out the Quilting Community on Massdrop for some unusual items at great prices. My next quilt was put together with glue! I cut out the circles, arranged them, glued them down with fabric glue, then pressed them dry with the iron, to set them. 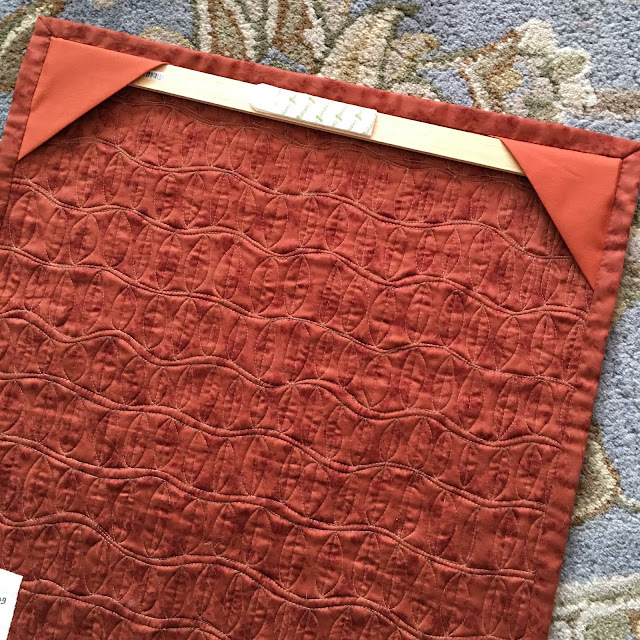 The quilting needs to be heavy in this case, to hold the fabrics in place. 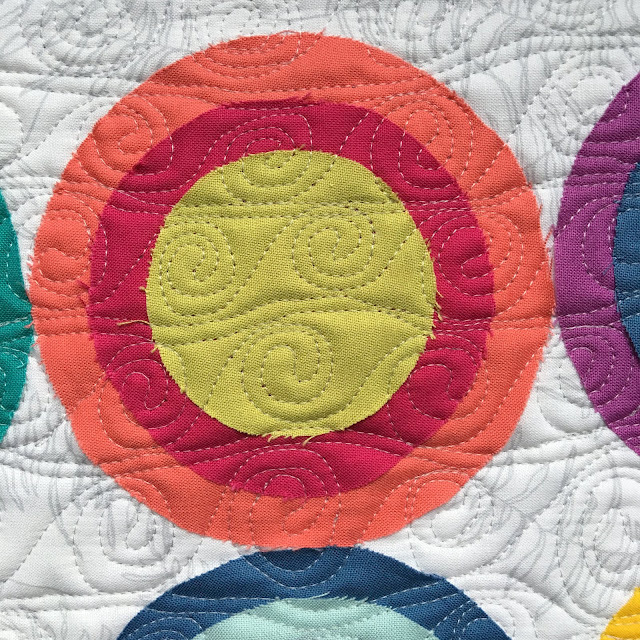 I did one of my favorite edge-to-edge freehand motifs on my longarm. 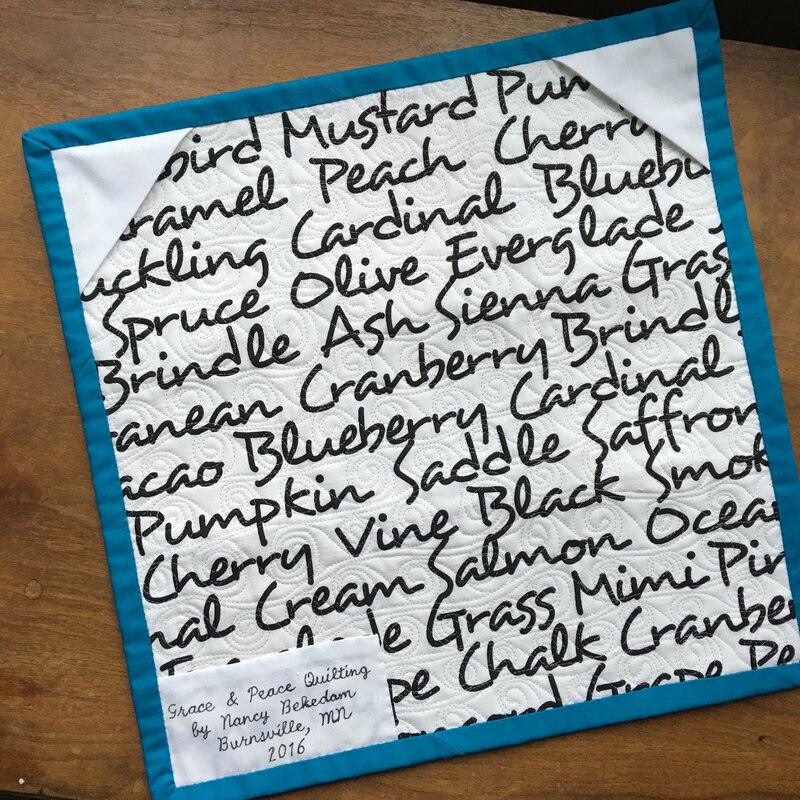 I had a bit more of the Crayola Crayon color names fabric for the backing. That was my last smidgen. 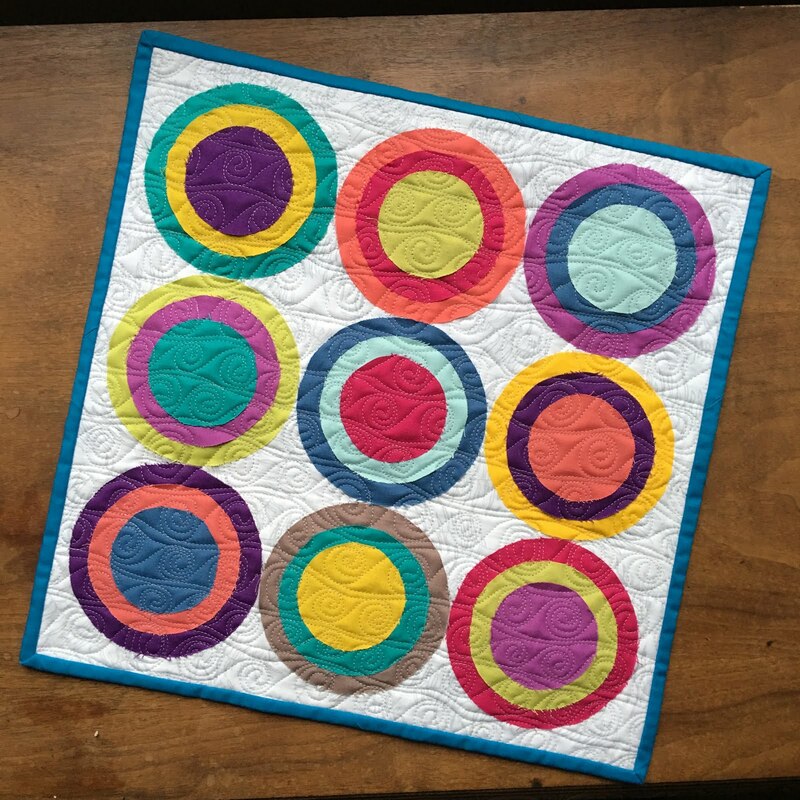 And mini quilt #3 is this Sunburst quilt, done in miniature. The blocks finish at 6". It's made from Liberty of London fabrics, also from Massdrop--a Christmas present from my son! Binding and backing is this Moda sateen finish fabric, bought from the 200 yen bin at Yuzawaya in Tokyo, Japan. Quilting is a freehand leaf motif. 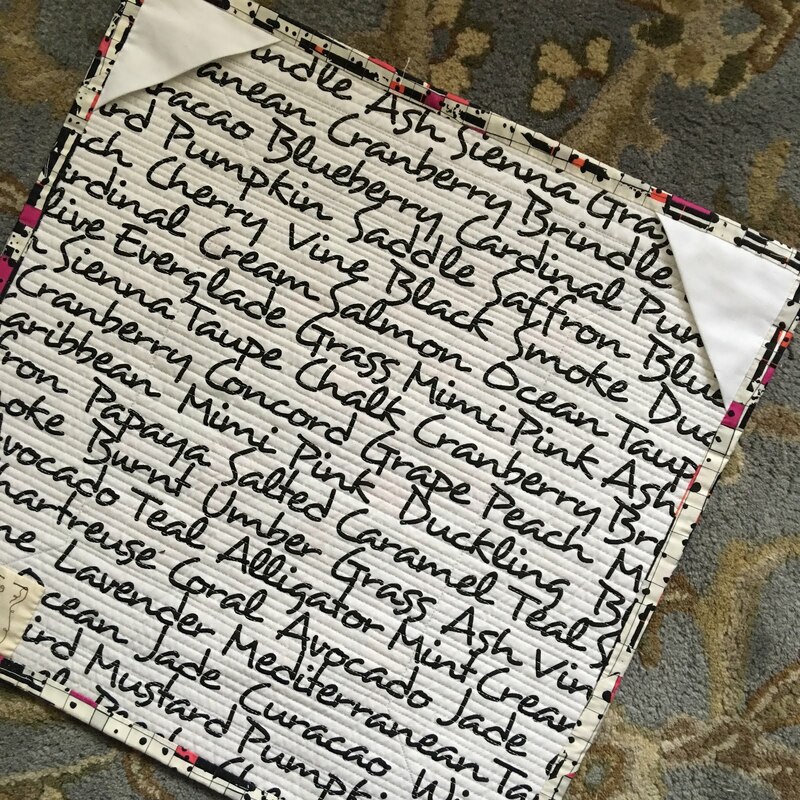 Confessions of a Fabric Addict--Can I Get a Whoop Whoop?! The three new ones in this post are wonderful! The circle one is my favorite...love those saturated colors. 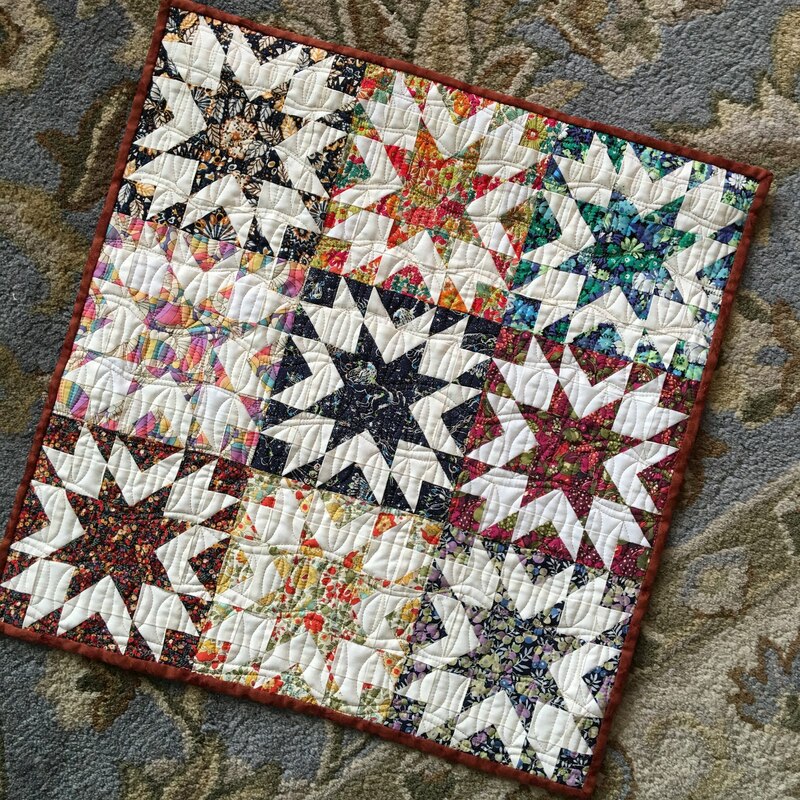 The leaf quilting on the third piece is new to me. That's a really neat motif. 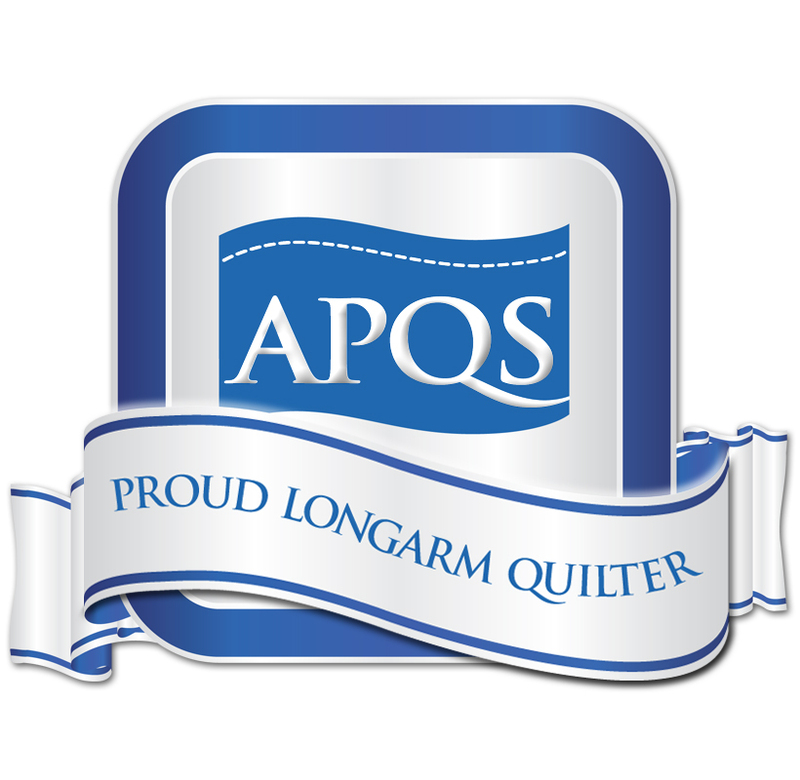 Louise, I do love your quilt photo backdrops, there on the water! The quilting motif is an inspiration from Free-Motion Quilting by Christina Cameli. She has so many unique edge-to-edge designs. 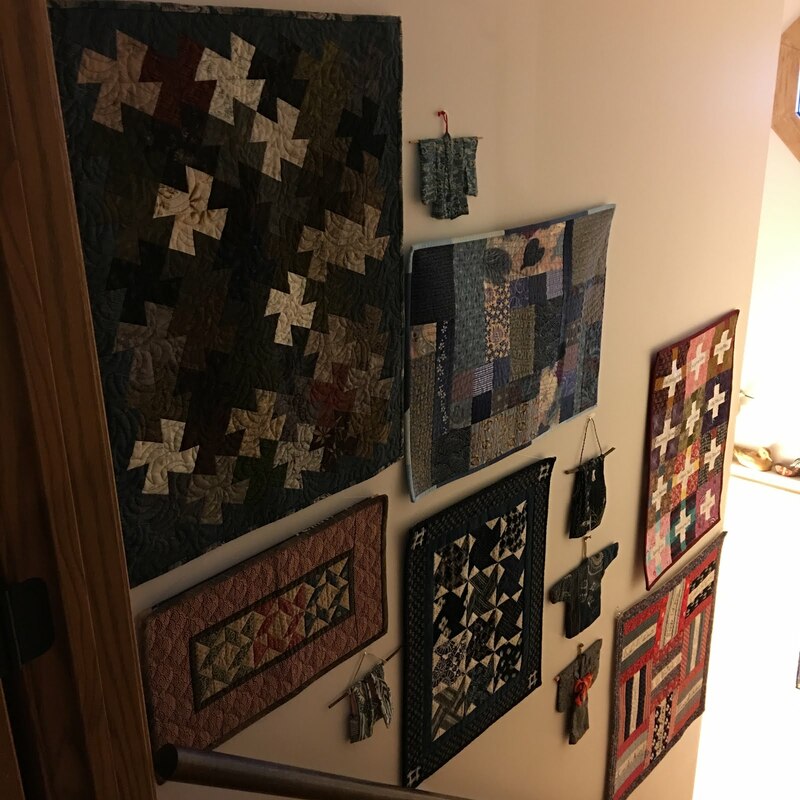 What a great idea – a stairway quilt gallery! It’s so gorgeous! 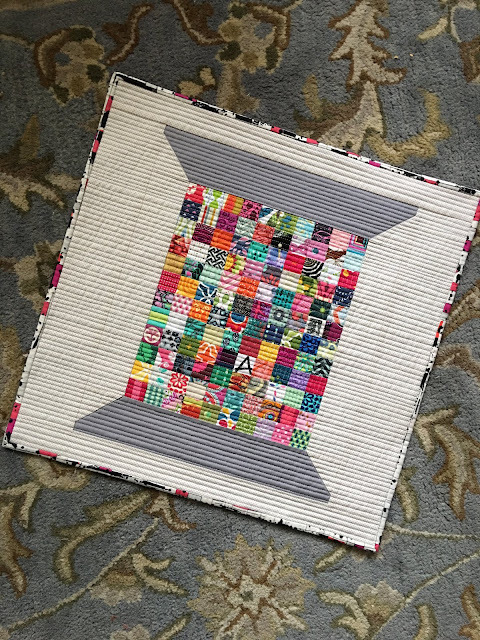 Your Mini Spool quilt is beautiful! I’ve never heard of holding fabric down with glue and quilting. Thank you for teaching me that! I’m amazed that your Sunburst quilt blocks measure at a mere 6”! Amazing! 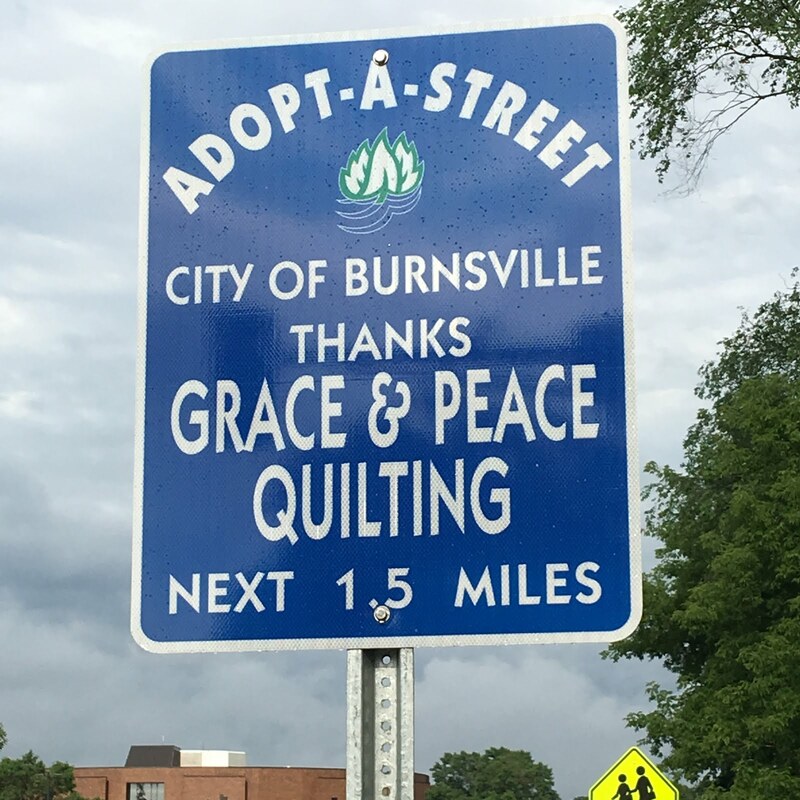 I’m so glad I found you at Busy Hands Quilts! Thanks, Miaismine! The glue trick works with applique that is going to be heavily quilted. I made the Sunburst quilt blocks at a rate of one per evening. These are beautiful quilts!! I love all three. Your quilting is gorgeous on them. Thanks, Ariane! I need to get going on another mini--quite a bit more space to fill!